Local singer songwriter Kate Lynn Trang may have gotten her big break when she was invited to be a guest vocalist at the Daryl Ong with Mary Kate Aquino concert in Calgary Sept. 9. The thirteen-year-old sang three songs, two of which she wrote. 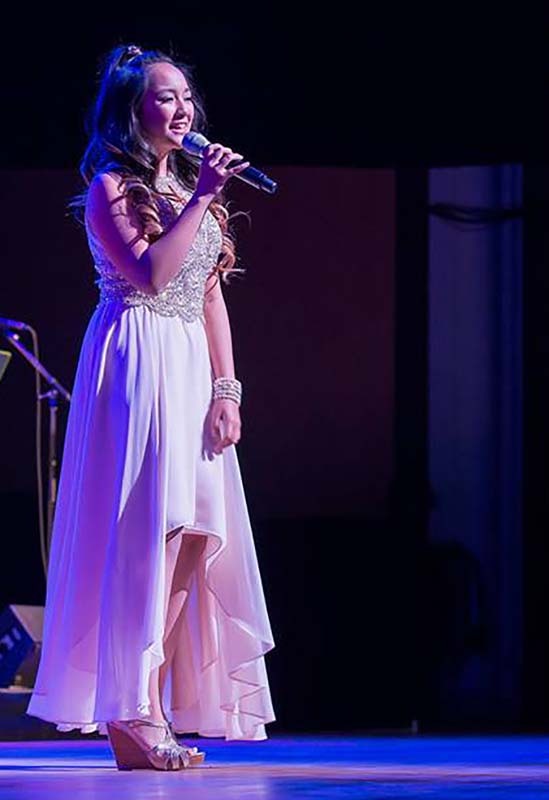 The invite to perform on stage at the Jack Singer Concert Hall came as Trang released her first single and was invited to sing in a singing competition in Calgary, despite being a year to young for it. While she couldn’t win the contest, singing in it got her noticed by one of the producers associated with the Daryl Ong with Mary Kate Aquino concert. “He asked us to be the special guest,” said Trang’s dad, Phuong Trang. Since then, Trang has received several invitations to sing at other events including, college graduations and pageants. Coming next for Trang, she will be opening for a Martin Nievera at the Grey Eagle Casino on Nov. 5. While Trang has been singer since she first could talk, she’s only recently started to perform. She said she really has only started to write and record for the last three years. Since being discovered, Trang said she has been having a lot of fun singing. “The thing that I like most is getting the experience,” she said. Seeing the reaction of the audience is also something that keeps Trang walking on to the stage even though she’s nervous before every performance. “I like seeing their responses,” she said. Although she loves to perform and sing, Trang says she is always nervous waiting to get on stage. Once she steps out into the spotlight though, all the anxiety goes away. “Once I’m on the stage, they all magically just go away,” she said. Even though she is always singing, now that she is performing as well, Trang has started seeing a vocal coach to help keep her in peak singing condition. Even with all this work and focus on singing, Trang said she hasn’t really thought to much about where she is going with her singing and song writing, she is just continuing to enjoy the moment. “I want to be at a point where…at least a community knows my name,” said Trang. She’d like to be known as a singer but hasn’t decided yet if this will be her career. Her parents said they are happy to support her wherever her singing takes her. “We’re just…going for the ride,” said her dad. “We support her 100 per cent,” he said. If she does decide to pursue this as a career, Trang is off to a good start. 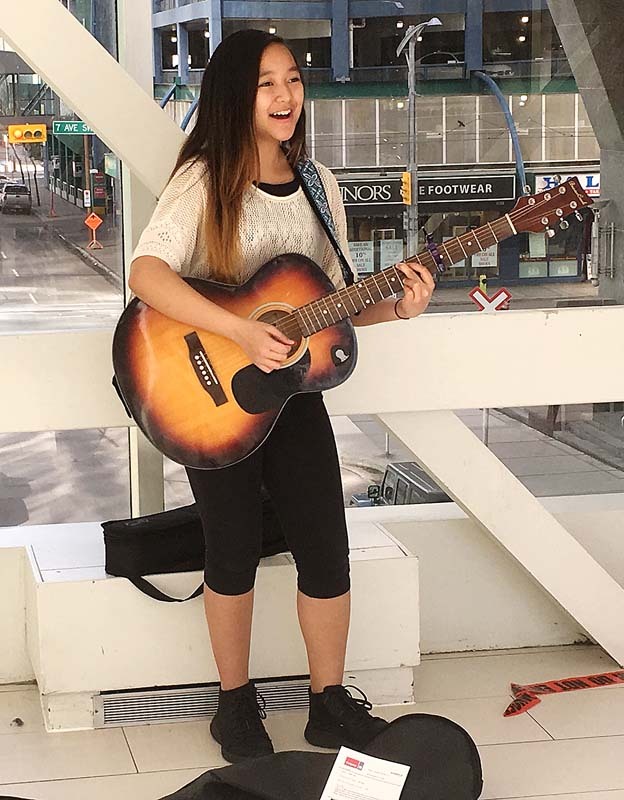 She paid for a year of her music lessons by busking in downtown Calgary during the Stampede this past summer. “I’m proud of that,” said Phuong. In addition to performing a lot recently, Trang will be releasing her first EP on Oct. 27. Trang’s Ep will be available online on iTunes and Spotify.